How can I style my fireplace mantel? Whether your home is modern, rustic, traditional, or ultra-contemporary, you will want to choose a fireplace and mantel that suits your chosen aesthetic. The fireplace mantel, mantelpiece, or chimneypiece as it is sometimes called originated in medieval times as a covering that was used to catch smoke. Essentially reducing the risk of interior fires and spontaneous combustion, mantels created a safer and more practical space to burn timber. Over the years, the mantel has retained its efficiency, while also becoming a stylish necessity to any fireplace, wood-burning, gas, or otherwise. The mantel that sits above the fireplace comes in many different styles, forms and designs. From bright colours, intriguing textures, or simple elegant finishes, there exists a plethora of classic or unique options. If you would like a helping hand and some stylish examples, check out the images below and ensure you pick your new mantel with confidence. First up we are taking a look at an antique style fireplace. 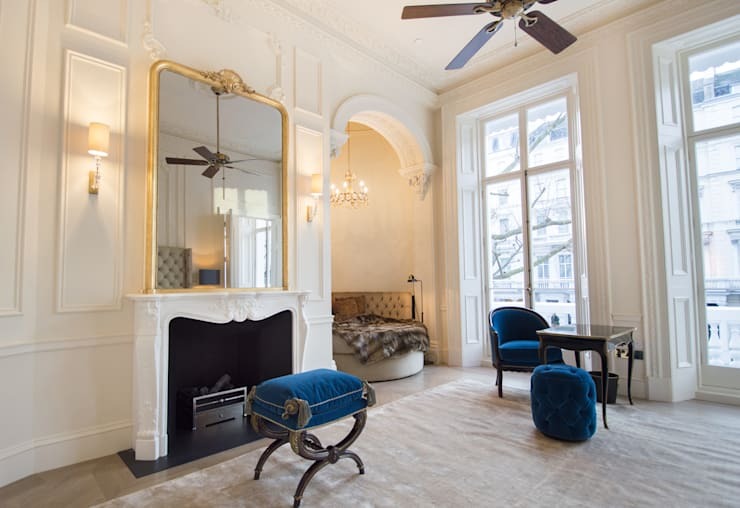 Antique design and style is perfect if you reside within a heritage or historic dwelling, but can also look fabulous juxtaposed against a more contemporary aesthetic. Evoking a sense of traditional, antique fireplaces and mantels are commonly adorned with an array of objet d'art, and were a popular place for individuals to position clocks, vases, and statuettes. Here in this example we see an antique marble fireplace and mantel with a modern fireplace interior. In this instance the designers have opted for simplicity. The mantel is used to rest a large similarly antique gold-plated mirror, which reflects the grandeur and majesty of the room. Paired with antique furniture, rich textiles, and light colour scheme, this space is simple yet opulent, managing to create a timeless sense of luxury and lavishness. Elegance can be a difficult thing to pinpoint. Highly subjective, elegance is something that might be seen by one individual, and not by another. So how does one determine if a design is elegant? To one person elegance might mean clean lines and minimalism, to another it may be a highly original yet simple design. In this example we are taking a look at a living room that truly epitomises what we believe to be elegant yet unfussy. The fireplace and mantel design is particularly strong, and enhanced by the strong lines, and clutter-free appearance. Timeless and chic, this piece would suit a range of interior styles, and is an elegant domestic statement. As timeless and enduring as heritage or antique fireplaces, the charm of a rustic wood burner is truly iconic. The term rustic encompasses a large range of different styles and designs. When we think of rustic design we immediately imagine cabins, farm houses, and large country homes each replete with their own version of fireplace. From large timber chalets with statement making fireplaces, to small country cottages, rustic charm is undeniably warm and welcoming. In this example we see a fabulous example of a rustic fireplace. Making its presence known within the centre of the room, and large enough to heat a space twice the size, this stone mantel is grand, usable, and highly efficient. Decorated with a wreath and statuette, the fireplace is simple enough to only require minimal adornments. 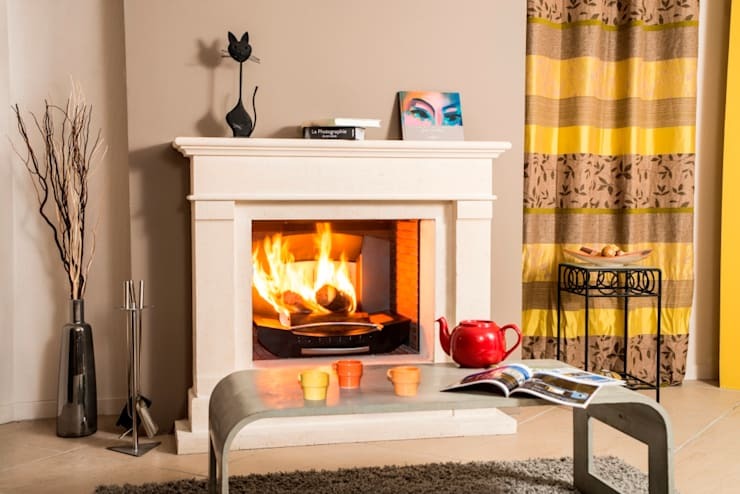 The modern or contemporary fireplace is a coveted home addition and feature. Boasting chic style, minimalist aesthetics, and an eye-catching design, this is one truly impressive mantel. The designer have taken the natural simplicity of this fireplace's shape and worked to ensure it is a standout element within this living room. Free-standing within the room, the mantel has been decorated using simple silver accessories and accoutrements. Vases are used to add that extra element, and look beautifully luxurious against the dark feature wall and bright white floors. 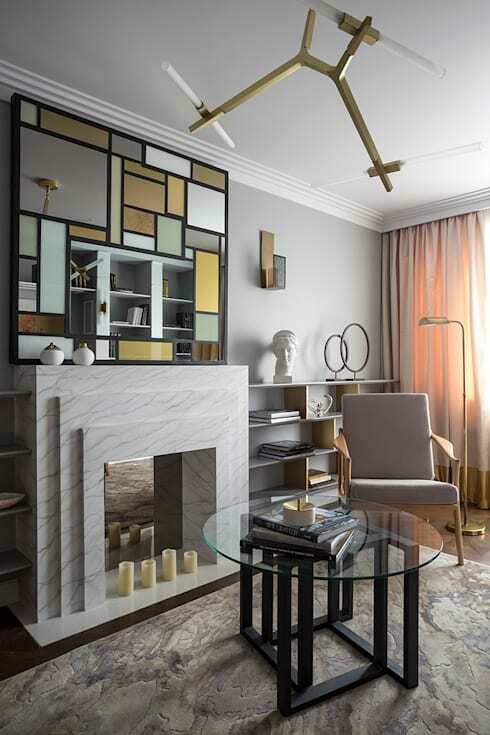 If you like the look of this modern fireplace and have considered adding one to your abode, speak to a professional interior designer or expert to ensure you get the right design and style for your space. When we discuss subtle and chic style, we are talking about designs that embody a sense of individuality, uniqueness, without feeling overbearing. Broadly speaking, a subtle and chic fireplace and mantel is one that evokes a feeling of class and style, but resists making itself the standout feature or attention-grabbing element within the room. The example above is a perfect illustration of this. 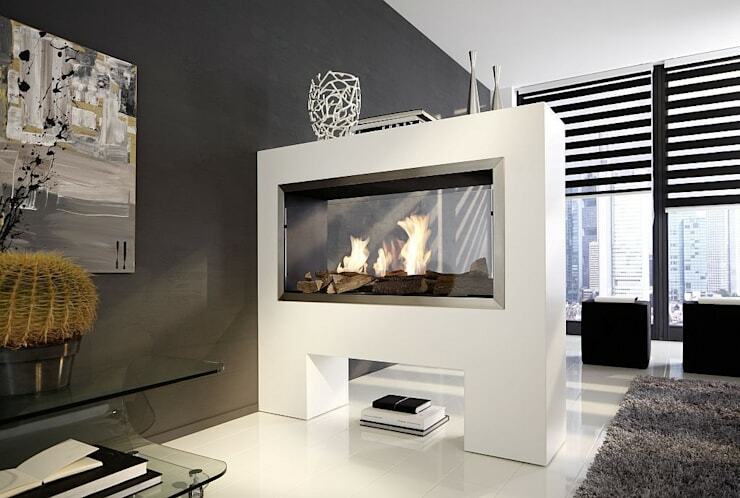 The fireplace is gorgeously minimal, with the mantel providing a place for a single sculpture. Painted a subtle grey hue, the tone of this fireplace works well against the slightly darker charcoal interior, as well as the artwork. This fireplace sure makes a statement, but is sympathetic to the other impressive features within the room. The statement armchair is a highlight, as well as the exposed timber ceiling. 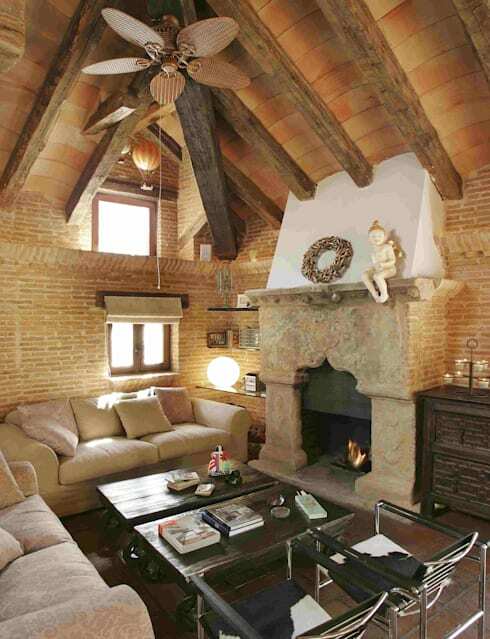 A juxtaposition of modernity and rustic charm, this living room is timeless and exquisite in its appeal and charisma. Last, but certainly not least we are taking a look at a more eclectic and fashionable design. Deco in its appearance with angular geometric forms, this fireplace and surround is a gorgeous example of unique yet age-defiant style. 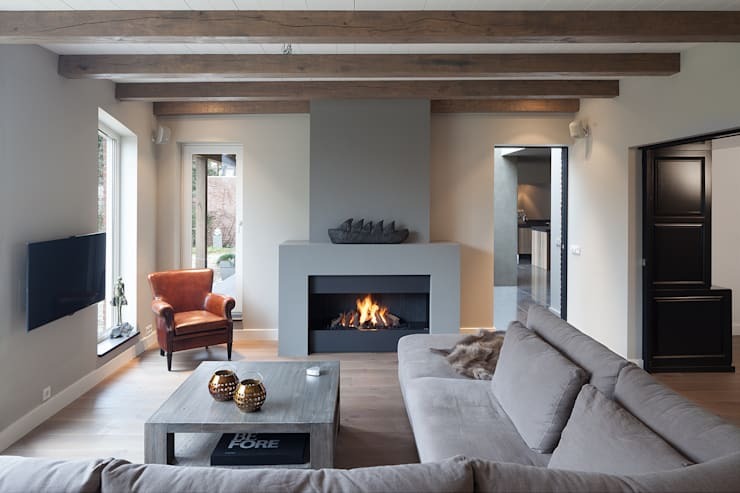 In styling and adorning this fireplace, the occupants have chosen a simplistic approach with minimalism the key to their success. The design hinges on the mirror that is set above the fireplace, and complements the room's overall aesthetic. The colour scheme is muted yet still eye-catching and employs a combination of greys, whites, and earthy hues to achieve a truly memorable design. Which fireplace and mantel design is your favourite? We'd love to hear from you in the comments below!